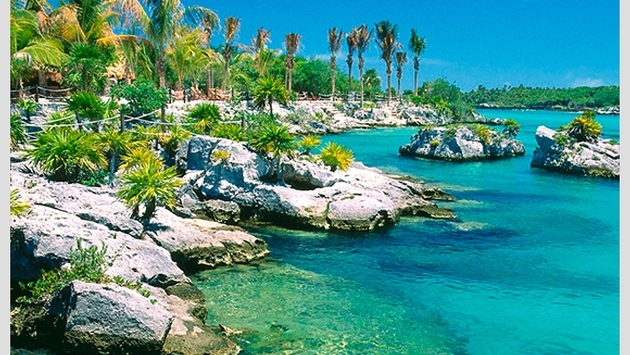 Riviera Maya's Xcaret park is lauded for its natural beauty, with visitors from around the world in awe of the unique locale. To get the most out of Xcaret’s water activities, the park has a recommended order to taking in all of its wonders. And good news: All of these aquatic features are included in the admission cost. One of three underground rivers in the park, this swim-friendly waterway has the most caves, and Xcaret recommends you arrive early and make it the first thing visited. A kind of natural Jacuzzi, waves fill these enclosures with seawater — some of the deeper ones can accommodate safe diving. A Cancun/Playa del Carmen staple are the beautiful white-sand beaches. Chill on the sand or in the water with a Pai Ai Pineapple, the signature cocktail from Xcaret’s beachside bar. Rent snorkeling equipment and check out this crystal clear underwater viewing spot. Several species of fish and marine turtles may make an appearance. This feature not only offers thrills, but also a unique view of the park. Back to an underground river for the finale. Pick either one for colorful scenery and a relaxing swim with the current taking you along. To find out more about Xcaret’s water activities, visit the park’s blog.